How should the United States be governed during times of crisis? Definitely not as we are in times of tranquility, asserts this classic study. The war on terrorism is a case in point. The horrors of terror attacks on the United States have forced Americans to accept legislative changes that might be unthinkable at other times. 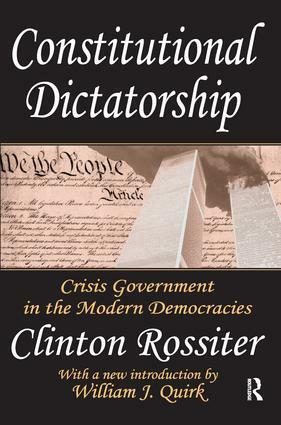 The "inescapable truth," Clinton Rossiter wrote in his classic study of modern democracies in crisis, is that "No form of government can survive that excludes dictatorship when the life of the nation is at stake. "In an insightful introduction, William Quirk places Rossiter's work in the context of the new century and the current war on terrorism. Constitutional Dictatorship examines the experiences with emergency government of four large modern democracies-the United States, Great Britain, France, and the German Republic of 1919-1933-to see what unusual powers and procedures these constitutional states employed in their various periods of national trial.Rossiter's concept of a "constitutional dictatorship" may be more shocking today than when he wrote the book. Based on a thoroughgoing study of the use of emergency powers in modern democracies, he determined that the facts of history demonstrate that there are occasions when constitutional dictatorship has served as an indispensable factor in maintaining constitutional democracy. Supreme Court doctrine does not recognize any implied presidential power to suspend the Constitution. However, Rossiter believes this view to be inaccurate. He defends his view through analysis of presidential action during the Civil War, World I, the Depression, and World War II, arguing that when the normal rules are not sufficient other rules take hold.Rossiter proposed specific criteria by which to judge the worth and propriety of any resort to constitutional dictatorship. He provides a clear roadmap for both citizen and Congress to judge an executive's actions. In his introduction, Quirk notes that Rossiter's concept-the rapid return to normal government when the crisis is concluded-rests on a premise that appears to be missing today. This volume will be essential reading for those interested in politics, constitutional law, and American history.